Football fever is on in the nation. Fans of the beautiful game can not only watch the best football moves but also help develop it in the country, courtesy Ola, the official ride of the teams. Last month, the booking app for cabs, autos and kaali peeli taxis, had initiated a chain reaction on social media. It threw on a football challenge and everyone from celebrities to startups have been taking it on in their ways of dribbling and juggling. 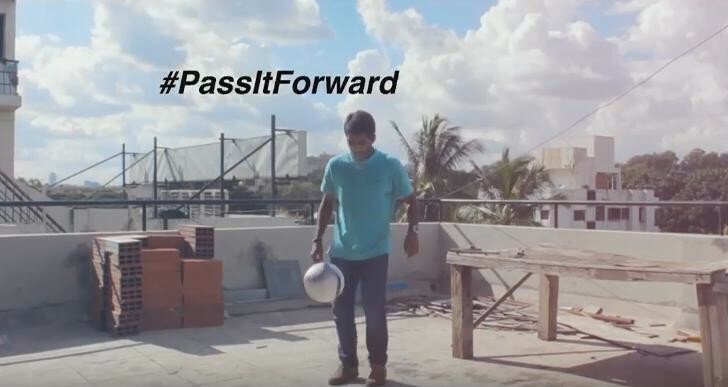 Aptly named ‘#PassItForward’, the social media initiative is to drive awareness for Slum Soccer, an organization that uses football to better the lives of street dwellers. Ola asked folks to show their football tricks in a video, share it on Facebook, Twitter or YouTube along with the hashtag, while nominating a friend or two. For every video submitted, Ola will donate to Slum Soccer to fund Edukick – a program in Nagpur that will help uplift the lives of 200 slum dwelling boys and girls. Flipkart to Myntra, who else? Tagging or nominating your social connections for a challenge is a smart way to spread the word for social cause campaigns. We have seen how the phenomenon started last year and spread across the virtual world through social networks. Last year, many social tagging campaigns sprung up following the massive social media success of the #IceBucketChallenge – an ALS awareness initiative started in the US, where one had to pour a bucket of ice cold water on themselves or else pay to the charity. The challenge was taken up by eminent people like Mark Zuckerberg, Bill Gates and others. Back in India we had the #RiceBucketChallenge that involved sharing rice with someone needy. PM Modi took a cue from this for his ‘Swachch Bharat Abhiyan’ and launched a cool tagging campaign that involved cleaning up your locality, taking pictures and tagging your friends to do the same. Shaadi.com also started a social movement for ‘Karwa chauth’ via social tagging. In a role reversal of sorts, the matrimonial brand asked husbands to fast for their wives on Karva Chauth and nominate other husbands to do the same. Ola’s #PassItForward has sure set things in motion for Slum Soccer. Cool use of social tagging for a cause campaign.